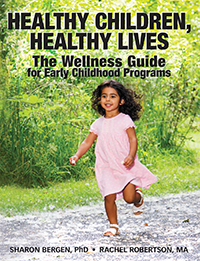 Sharon Bergen, PhD, and Rachel Robertson, MA, teamed up to write Healthy Children, Healthy Lives, a resource with checklists to help integrate wellness into early childhood programs. It’s easy to see that they share a passion for health and wellness. But what does the coauthor of a wellness resource snack on? Which coauthor is an avid mystery-solver? What are their recommendations to jumpstart wellness in an early childhood program? Find out here. We’re always interested to hear where book ideas come from. What prompted you to team up and write Healthy Children, Healthy Lives? I have always been focused on my own children’s health and diet, but have found it difficult to know where to turn for reliable information and resources for things like making healthy meals children will like or how to best introduce new foods. As more and more information about the national obesity crisis emerged, I realized that this was a shared challenge and that families and child care providers could really use a one-stop shop for resources and information on all wellness issues. Reflecting back on my own years as a teacher and center director, I realize how much I could have done, quite easily, to make a positive difference for children in their physical development and overall wellness, but didn’t because I just didn’t know how important it was or how to do it. I don’t want any other teachers or directors to not know what to do. Like most early childhood professionals, there are always more projects to be done than time to do them. Rachel and I both put a lot of thought into the projects we choose. For me, this project was important for three reasons. First, I feel strongly that the early childhood years present the greatest opportunity to address some of the crucial wellness issues confronting us today. As early childhood professionals, we can make an important impact in children's habits and choices. We can help them choose a healthy lifestyle, one from which they will benefit their entire lives. Second, I feel there is a great deal of really good information available for early childhood professionals on topics related to wellness but few that pull it all together for practitioners in a way that makes it easy to use. As Rachel and I worked through the format and content of the book, we were really dedicated to creating something that put as much emphasis on how it can be used as it did on presenting good content. I think we found a good balance that has resulted in something professionals will use as a go-to resource over time. Finally, my selfish reason for working on this project was the chance to collaborate with Rachel. Rachel and I have known each other and worked together for many years, but this was our first chance to do a book together. I really admire Rachel's first Redleaf Press book, Prove It!, and was honored to work with her on this project. I hope it will be the beginning of many more creative collaborations! Why is this an essential book for early childhood professionals? As educators of young children, we have committed to supporting their healthy development in all areas. But it seems we focus more on the cognitive development, some on social and emotional development, and very little on physical development. Because many kids are enthusiastic climbers, runners, jumpers, and skippers, we sometimes forget there is more to do to nurture their healthy physical development. Additionally, there is so much that can be done that it can seem overwhelming. Healthy Children, Healthy Lives breaks down the myriad of things a child care provider can do into simple indicators that teachers and directors or family child care providers can focus on one at a time. Why is creating the foundation for wellness so important during the early years and in early childhood settings? As we all know, young children are busily growing inside and out in their early years. Brain and body development, as well as behavior, are impacted by nutrition, health, and physical development. If we want to ensure an optimal learning environment, this doesn’t just mean the spaces are beautiful and age-appropriate, it also means a child’s inner environment—their brain and body—are beautiful as well. The early childhood community is in a unique position to positively impact children’s health for a number of reasons. First, we have a captive audience. Children are with us every day, typically for many hours. Second, they are developing tastes, preferences, and habits from infancy. Whether a child is willing to try new foods can be influenced at a young age, whether a child feels good about themselves when they participate in active games starts at a young age, whether a child is well enough to play, laugh, and enjoy their activities is an important factor, and so on. Early childhood is the time when children begin to form habits for life. It is also the time when they are very susceptible to hazards because they are still developing. 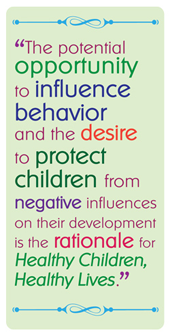 The combination of the potential opportunity to influence behavior and the desire to protect children negative influences on their development is the rationale for Healthy Children, Healthy Lives. As you mentioned, there are many areas of wellness to consider. How were the six topics in Healthy Children, Healthy Lives selected? When considering children’s wellness, it felt incomplete to only think of nutrition and physical activity. A primary area of focus for me has been social-emotional development and resilience. These areas of emotional health are as important as physical health. And who can forget illness and safety when thinking about young children? But we wanted to be sure we emphasized prevention and being proactive, rather than reactive-only approaches. Finally, we thought it was critical to include a section on leadership. Teachers can certainly change or enhance their practices, but without the support of strong policies and procedures and excellent communication with families, there will be barriers and resistance. Plus, teachers—those who teach and model for children every day—need support for their own wellness, too—things like stress relief, healthy snacks, time for mid-day walks, etc. This can only happen if the leader is committed. The six sections we decided on represented, for us, the best divisions between the topics that supported our interest in creating a very usable book. We felt these divisions would allow a program to focus on one area at a time if they chose to do so. At the same time, we knew it would be impossible to create sections that stood entirely on their own. One of the challenging aspects of this topic is the way in which topics are related. For example, to help promote physical activity we want children to have access to playgrounds that have interesting equipment that present exciting physical challenges. But we also want playgrounds to be safe and to have equipment that does not present unnecessary risks to children. So, from the beginning, we recognized that some topics might show up in multiple sections. Do you have any recommendations to jumpstart wellness in early childhood settings or within our personal lives? Evaluate the beverages in the program. “More water, less juice” is my new slogan. Eliminate flavored milks and have a no-soda policy—including removing soda machines in the staff lounge (if that’s too radical, have a no-soda in the classroom policy). Require that all children and teachers be prepared to actively play every day. This means tennis shoes and weather-appropriate clothing. Eliminate television or movie watching from your program, if you haven’t already. There is no learning value and it increases the time children spend being inactive. Plus, television often exposes children to commercials of unhealthy foods. Purposefully teach children the skills they need to understand and regulate their emotions. A good way to teach this is though modeling it! Walk when I can. I try to take the stairs and not the elevator, park away from the door and take a longer walk, etc., whenever possible. Eat more green. Changing one meal each day to a salad is a simple way to add more vegetables and to cut calories. For early childhood environments, one simple practice I recommend is to create two checklists: a cleaning checklist and a daily safety check. Using these two checklists each day is a simple strategy to improve the health of the children and your health, too! 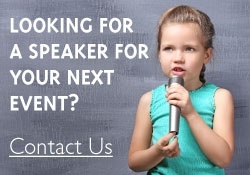 You delve into many important topics in Healthy Children, Healthy Lives, but we’d love to learn about you, too! Spill something about yourself. Do you have any hidden talents? How do you fill your free time? Writing this book has inspired me to get creative and enthusiastic about my family’s health in new ways. Our latest adventure was to try stand-up paddle boarding in the ocean and our latest favorite healthy snack is a mixture of almond butter, dry slow-cooked oats, flaxseed, honey, coconut, and nuts. Having fun while being healthy makes a huge difference. I am a big-time night owl. It is probably not an exaggeration to say that most of this book was written in the wee hours of the night. Since Rachel and I live two time zones apart, my crazy schedule was actually an asset in our collaboration. I’m not sure if this qualifies as a hidden talent, but one of the things I felt I brought to this book was a passion for program improvement and the ways in which quality manifests itself in early childhood programs. In my dissertation research, I looked at the ways in which early childhood program directors define, measure, and improve quality. It was surprising to me how few directors use any kind of measurement tools to benchmark their quality or to create quality improvement plans. That interest in quality improvement is definitely woven throughout Healthy Children, Healthy Lives. I am an avid reader of both fiction and nonfiction. It’s probably not a surprise that most of the nonfiction I read focuses on early childhood education topics. But my fiction reading usually focuses on mystery novels. I usually solve three to four mysteries a month! And, while I love writing nonfiction for the early childhood profession, writing a mystery novel is always on my bucket list! Learn more and see a full list of titles by Rachel Robertson and Sharon Bergen.